As it was Cinco de Mayo on Saturday and Mexican food is an all time favourite I thought I would play with some fun salsas. I have been learning about South African edible indigenous plants and found that Spekboom is edible! We have been surrounded by this beautiful plant and have never tried it, we are so reliant on what find in the shops rather than what we can actually find around us. Spekboom is also an incredible air cleansing plant and can live up to 200 years withstanding drought and frost It also grows fast so it's great all round. I'm not going to give quantities here because it really depends on how many tacos you are making for. Just keep tasting for balance of lime, saltiness and sweetness. The best thing to do it to prepare everything else before you start dipping and frying your avocado. Start with the refried beans as they can cook for a whole. Finely chop the onions and garlic and add to a pan over medium heat with spices. While they fry drain and rinse your black beans and add to the pan. Fry on low until the beans are soft, mash some of it and keep some whole and fry for another 5 minutes. Taste and adjust the salt accordingly. Grate the slaw ingredients and mix together. Chop all the salsa ingredients and mix in a bowl. Make sure that it is nice and zesty with enough lime. 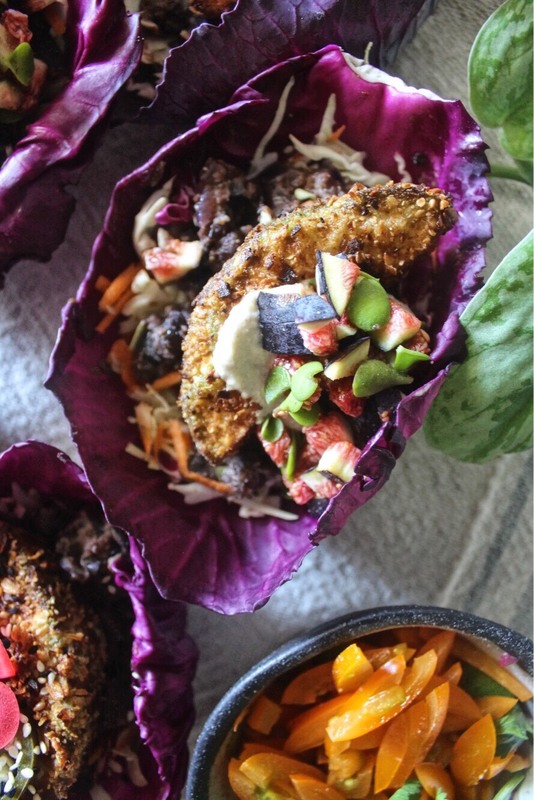 Set up your tacos - I used purple cabbage leaf cups - but you can use any tacos. Stack the tacos with slaw then beans. Put oil on the stove to warm up. Blend the flour, oats, coconut and sesame seeds together and put in a bowl. Slice the avocado into slices and dip each into the agua faba and then in the flour mix and drop into the oil. Take out when the crumbs are golden brown and place on a paper towel to drain the oil off, then place in each taco on top of the beans and cover in salsa. I also added jalapenos and pickled onion too with a sprinkle of black sesame seeds.